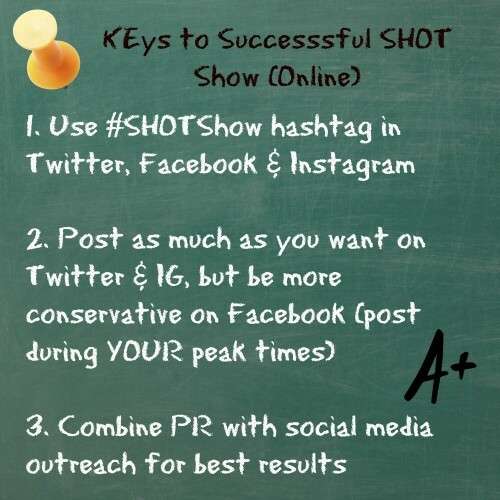 Are You Effectively Using Social Media to Drive #SHOTShow Traffic? Are you using social media channels to drive SHOT traffic? And are you using them effectively? On Facebook, Twitter, Instagram, Vine – use the hashtag #SHOTShow. Many people just do a search on that hashtag to see the latest. In fact, I have a column on my TweetDeck page that is constantly refreshing tweets with #SHOTShow hashtag. During the show, I’ll create a search on my Twitter app to see if there is anything I’m missing on the show floor. still king when it comes to engagement on any social channel. Video is even better! If you are trying to get the attention of someone (media person or buyer perhaps) tag them in the post on Twitter or Instagram! That way you KNOW they saw it. And maybe it will help spark a conversation. And what about traditional PR? The news release is not dead, at least not in the outdoors space. Do you have signings at your booth? Is someone famous stopping by? Put out a release on it to Outdoor Wire, Ammoland, Outdoor Hub, to name a few spaces people read. Trust me, the week of SHOT Show, everyone who is anyone is reading those three news outlets. Just an observation, but if you troll through the #SHOTShow tweets, count how many “big brands” are utilizing this marketing tool. Not very many – its mostly the smaller companies who have a leg up on finessing social media channels. Why is that? Are they hiring the right people? Are they giving them more freedom online to make the right decisions? For example, take a look at the three companies sponsoring a Tweet Up on Monday night of SHOT Show – Real Avid, Hawke Optics and ME! No large companies here – but combined we have quite the reach. You don’t have to be big to make an impact. Just get out there. Good Luck at SHOT!